There’s no mystery to it – a good 5 a side football team does the basics well. They attack and defend effectively, they’re organised and they almost certainly have a pretty decent goalkeeper too. You’ve probably played against that team before. The one that you don’t think is any better than you, but still managed to comfortably beat you. How did they do it? Here’s how: they knew what they were doing. Call it experience, organisation, or whatever you want – they know what to do to win. Sure, a certain amount of talent helps, but just knowing the most effective strategies counts for a hell of a lot. So what are the tips and strategies to win at 5-a-side football? Well, here is a list of the very best tips that you can start applying the very next time you play. NOTE: the list below represents our best quick-tips that you can instantly start using. Whilst you can go a very long way with this list, there are some aspects that need a little more explaining, and need to be developed over more time. 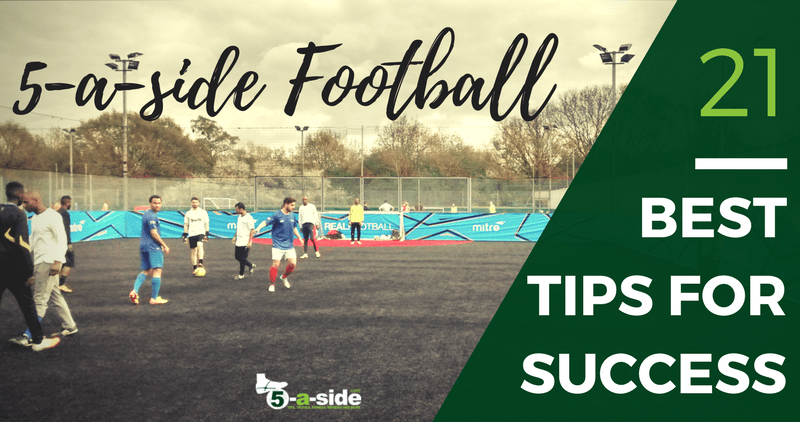 So if you’re really serious about getting better at 5-a-side football, check out the 11 Best Tips and Strategies to help you win at 5-a-side – The ultimate guide. You might scoff at the idea of having a formation for 5-a-side, and it will probably all get messed up within the first couple of minutes of running about, but lining up with 4 people thinking they’re playing as attackers and no defenders is suicide (and surprisingly common). It might seem a bit serious, but some basic tactics really do help. In 5-a-side, good talking can make the difference, making sure that there’s enough cover at the back; letting people know when they’ve switched off; offering your teammates help and providing a little encouragement. This is especially important for the keeper and last defender as they can see the full picture of what’s going on. Yes, it sounds cheesy but you can’t underestimate how many players struggle in 5-a-side because they get too frustrated. Whether the source of your annoyance is your teammates, the opposition or yourself, don’t let it affect your game. Better still, fix the problem. This is absolutely crucial. When you lose the ball you all defend. Teams that all get back quickly behind the ball are a nightmare to play against. You’ve got a limited amount of energy so don’t waste it on solo missions chasing the opposition in their own half, unless your teammates are supporting you in the press. A lot of teams find it more effective just to conserve their energy, regroup, and press in their own half. It doesn’t need to always be the same person, but make sure someone provides cover when you attack. They will guard against any fast breaks (so many goals get scored on the counter-attack), as well as helping to organise the other defenders. If you’re caught in a 2 on 1, position yourself between the ball carrier and the obvious pass, then patiently try to shepherd the ball carrier wide and away from danger while you wait for support. That’s how players get past you easily. Instead, focus on blocking the shots and showing the player wide and into the corners or away from goal. Try to always put pressure on the opposition player – even if you can’t win the ball, the pressure is often enough to put them off and lead to a wayward shot or mishit pass. Figure out which is your opponent’s bad foot and always show them onto it. How many genuinely two-footed players do you know? If you’re truly serious about winning, you might consider exploiting their weakest player. You want them ball to go to them as much as possible, so you can sneakily leave them a little more space, encouraging their teammates to pass to them. Of course, the moment the ball arrives at their feet, you’ll be there cruelly shutting them down and putting the pressure on. Sounds harsh, but how badly do you want to win? Defend like a legend: there’s plenty more where these defending tips came from. We’re only getting started above. To really delve in deep, check out the ultimate guide to 5-a-side defending. When the opportunity is on, calmly but quickly seize the chance to attack an outnumbered defense. Be careful not to force it with a poor quality pass, inviting trouble back on to you. The team that reacts quickest to the counter attacks usually wins. Don’t suddenly start dribbling like Maradonna if pace, trickery and coordination isn’t your bag. Similarly, if you scored a long-range screamer 15 years ago, but you haven’t hit the net in your last 374 attempts, it’s time to stop those speculative shots from distance. Be realistic about what you can do to effectively help the attack. Don’t over-complicate things. Have a couple of skills that actually work, and then use them effectively. Don’t just be a show-pony, if you dribble past a player, make use of it, don’t just circle back for another go. You know, those pointless dribbles into the corner. That’s where the opponent wants you to go, as it’s hard to do much damage from narrow angles. In 5-a-side the goals are nice and wide so when you get half a yard of space within 15-20 yards of goal just put it into the corner. There’s no sweeter feeling. Take the opportunity when you’re balanced but, if the moment has gone, don’t be afraid to play a pass back and build again. And don’t just try to smash the ball as hard as you can, you’ll usually just sky it or screw it wide. So often the keeper is caught off-guard by this cheeky little technique, as there’s so little backlift. By checking or feinting to receive the ball in all areas of the pitch, you’ll make it really hard for the defenders to mark you tightly. Don’t stand still in attack, keep on the move. Most teams will be able to shut down a good dribbler by outnumbering them, but if you can pass it well then you’re on to a winner. If the quick break isn’t on, move the ball around. Don’t force a forward pass that will just give away possession. Too many times players give away the ball by just assuming that somebody will be there to receive the pass. Look up and then play a pass that’s easy for your teammate to receive and control. Once you’ve passed, move. Don’t just stand there admiring your work. Having a good 5-a-side goalkeeper between the sticks is one of the simplest ways for your side to get a lot better. The keeper has a massive impact on the game. Goalkeeping in 5-a-side is rarely about making full-length diving saves. The majority of the time it’s about coming out and blocking close range shots. Saves are often made from just sticking out an arm or a leg, rather than a full dive. Don’t just stay on your line the whole time – get out and narrow the angles. Too many times goals are given away by the goalkeeper rolling the ball into trouble. When the ball is with the goalkeeper, use that to reset, regain positions and start to create space for the keeper to safely roll the ball out. Keepers should roll the ball out with a smooth, under-arm bowling action so that it’s easy for the player to control. More on Goalkeeping: It really is a specialist subject for 5-a-side. If you’re a goalkeeper (or you know one who could really use some tips!) see our ultimate guide to 5-a-side goalkeeping.